Oh oh ohhhh, it’s time for me to absolutely shriek my love for this marvellous novel. SHRIEK I TELL YOU. It is just that good and I seriously…what even are words? How do I use them? AHHHHHH. For the first 100-pages I was actually dubious. I’ve read two other Sarah Fine books and been “meh” about them. But The Impostor Queen? I SHALL BE HERE FLAILING LIKE A DERANGED GRAPE IF YOU NEED ME. And obviously I’m going to give you a list of reasons why you must read it NOW. Because books this good DESERVE LIST LOVE. It is an epic fantasy with epic world building that makes it the best of mostly ever. I usually find YA fantasies lacking in world building? BUT NOPE HERE. The world was detailed and large and kind of terrifying, to be honest. I love it, but I’m not moving there. Magic system = SO MUCH WIN. It does use elements, which usually bores me because eeeverybody uses elements gosh darnit. BUT THE IMPOSTOR QUEEN DOES IT DIFFERENTLY. (Which is how the great books are born.) A person either has a little bit of ice or fire or both…and if you have both you can balance them and be fabulous. The queen (Valtia) is like THE most powerfully balanced magic wielder in the world and keeps the people safe, the seasons controlled, etc and etc. Elli, the next queen, has exactly no magic. (That’s in the blurb, so not a spoiler.) Aka, she’s so screwed. Also I liked how the “chosen one” trope was turned on it’s head. Elli isn’t a dead loss…but she’s not chosen the way everyone thinks she is. Elli, herself, was entirely admirable. Although not my favourite? I think she was nearly too perfect. Oh don’t get me wrong, she made mistakes and said the wrong things and ALL THAT. But she wanted to try so hard and did everything and she was brave and honourable and hardworking and…seriously woman. I feel like a gnat. I just didn’t find her relatable? By the way, small surprise here: I REALLY JUST LOVE BOOKS ABOUT QUEENS. I want to be queen. So that’s probably why. As for the story line: I WAS NEVER BORED. NEVER. It’s slowish at the beginning but so so interesting. And omg it has wicked end-of-chapter-cliff-hangers. I seriously spent half my time going “I’m stopping after this chapter”…only to read like half the ENTIRE BOOK because I could stop. Couldn’t stop I tell you. It has survivals and torture and ceremonies and running and freezing and wars and rebels and bandit caves and gahhhh SO MUCH STUFF OF AWESOME. I also want to admit it feels like a violent YA dark version of Disney’s Frozen. Okay, that sounds weird, I admit. BUT IT WORKS FOR ME. They wield ice and the love-interest is a big bearish (but secretly marshmallow) guy like Kristoff. And Elli totally has an Anna/Elsa vibe. And the culture was all snowy and Slavic. SO THERE. But a brief note on the names: At the beginning I was “wahhhh what is this” but the names are honestly weird but still edible. There are different words for the queen (Valtia) and then the people are call the Kapari, and the enemy is the Soturi. (I think I’ve got all that right???) The characters are named: Elli, Oskar, Sig, Freya, Maarika, Tuuli, Aira, Raimo, Kukka, Senja… But I handled it. But let us pause for a moment to embrace the dorky adorableness that is: OSKARRRRRR. Okay Oskar is like a moody bear, but he’s so kind and sweet and TRAGIC. Yes, he has a tragic backstory. And he cares for his mother and sister like nothing else. WHICH IS SO AFJDKALFSD. His and Elli’s romance is slow and complex and a very small sub-plot to the story overall. They’re both actually focused on FIGHTING first. Potential kissing second. And I shall mention my second darling who’s name is Sig and he’s horrible. He’s a raging inferno of flames and temper temper temper. But I accidentally adore him? He and Elli clash like nothing else, but he and Oskar grew up together. LIKE I WANT A BOOK ON THEIR BACKSTORY YES PLEASE AND THANK YOU. I loved Sig because he was hot-tempered, tortured, and passionate. I’m literally exhausted with all this intense fangirling. Basically this book is everything excellent you could want. Good writing. Good excitement. Good torture. (That makes no sense but go with it.) And good twists on normally average plot devices. The characters are amazing — all of them are complex and dimensional! There are plot twists and freaktastic descriptions. TORTURE AND BLEEDING. Also MAGIC AND MAYHEM. But I’m crying because it’s an entire year until the sequel. DUDES. THIS BOOK AND I ARE TRUE LOVE. THANK YOU TO SIMON & SCHUSTER AUS FOR THE REVIEW COPY. 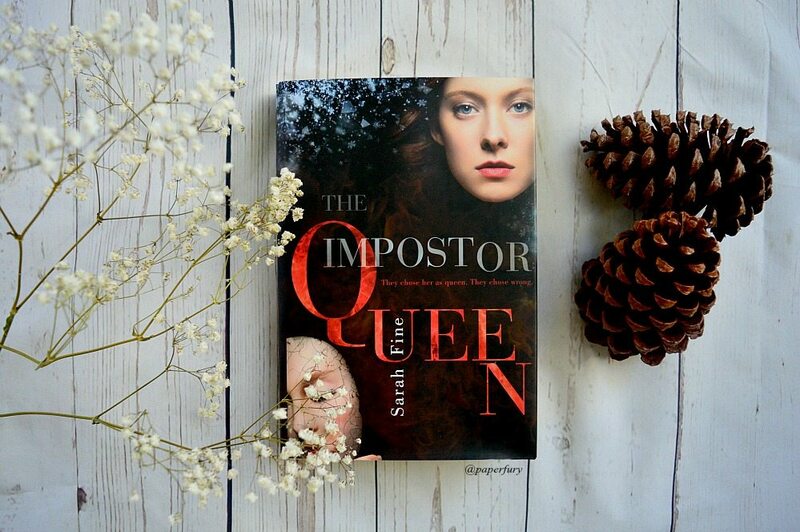 The Impostor Queen by Sarah Fine was published January, 2016.
which genre is your ultimate weakness?? (spoiler: mine is fantasy) and do you have an author you felt “meh” about … but then turned into a rabid fan of?!? LET ME KNOW ALL IN THE COMMENTS!! 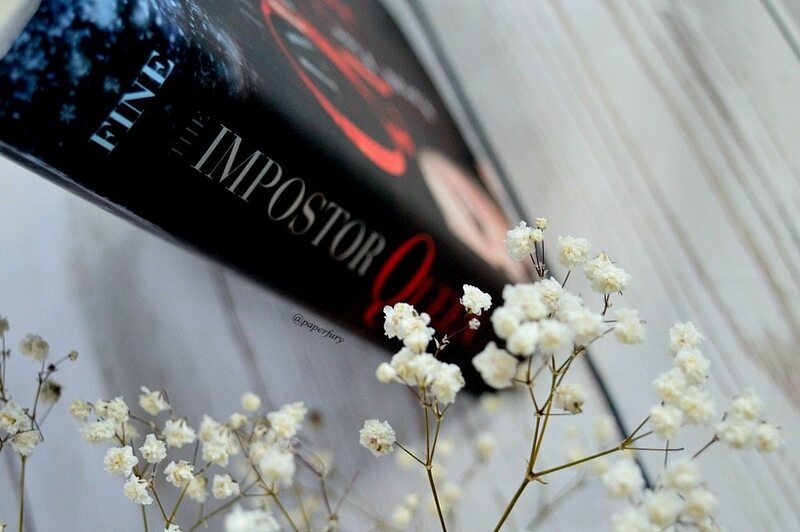 also of course you’re going to read The Impostor Queen. i just know it. but if you have already, what did you think?!? The real question is, will reading this book also turn ME into a deranged grape?! 😛 Oh my god, Cait, how do you even come up with all those descriptions? Anyway, one of my other bookish friends just recommended this to me on Goodreads, so I’ll definitely make sure to read it… but, gah. SO MUCH HOMEWORK = SO LITTLE TIME LEFT FOR READING. Blehhhh. OMG. Yes! Listen to the recommendations, we speak TRUTH. Another one to add to the list, you had me at dark version of Frozen. Historical is my ultimate weakness, which is a bit weird, since I don’t actually read a lot of it. I read a lot of contemporary and fantasy, and I love them both, but a historical book is probably twice as likely to make it onto my to-read list. I don’t know about an author I’ve completely changed my opinion of…maybe E. Lockhart? I read The Disreputable History of Frankie Landau-Banks and I wasn’t a fan, and then I LOVED We Were Liars. But I haven’t read anything else by her since then, so I don’t know. 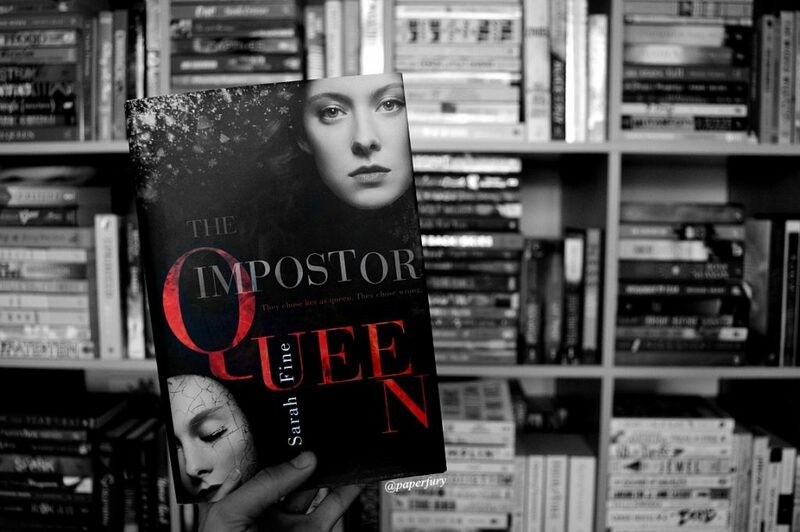 I wasn’t sure whether I was going to pick up The Impostor Queen – it doesn’t QUITE sound like the kind of book I’d usually go for – but after hearing so many good things from people, this review decided it. I need to read this book. I NEED a fantasy where the romance is a small subplot. OMG, I NEED TO READ THIS BOOK SO BADLY. It sounds really really really good, and I love the cover, especially the mask-ish thing at the bottom corner. *drools over book* And your book photos look so delicious. (I also have the same kind of flowers on my table right now, so bonus points.) But yes, I need this book. For my ultimate genre weakness, it would have to be Science Fiction, and specifically, anything dystopian. I just need all the cool books, like, right now. But my second favorite genre would be fantasy, and I’ve been starting a fantasy binge, so that’s been fun. Sci/Fi and Dystopian ARE quite awesome, but tbh, I haven’t read enough sci-fi SO I NEED TO FIX THAT EVENTUALLY. Fantasy is my weakness. I actually did not fall in LOVE with the Archived but ADSOM and Vicious made Victoria Schwab my favourite author. And THIS BOOK SOUNDS SO GREAT AAAAAH. I love writing about royalty too … probably because of the brainwashing. Huh. Yes the brainwashing is working marvellously. You absolutely HAVE to read ADSOM this week because next Monday 9 PM EST the author herself will be joining #ADSOMreadalong and we can ask her ALLLLL the questions. EEEK. If you can hop on Twitter … YOU SHOULD. I’ll definitely be there. I’M READING IT RIGHT NOW!!!!!!!!!!!!!!!!!!!!! I reaaaaally want this one and you’re not helping, Cait! YES TO QUEENS. I definitely have to read this if just for research, because NORTH. It will come in handy for whenever I write my awesome Norse epic fantasy. ANYWAY. I love all those names <3 <3 They are perfect. And I love the weird elemental magic stuff. I think unique magic systems are some of my FAVOURITE parts of books (like in Eragon…just saying). OMG YES. You must read this for research Emily. *nods sagely* Also I love that you’re writing fantasy now, btw. :’) It gladdens my writerly heart. OH SHH. I’M GOING TO READ ERAGON. I PROMISE. You MUST, Bee. I’m pretty extra sure that is just a book everyone needs. Pfft, your TBR loves me. Idk what my weakness is when it comes to books. Because I will read any YA book if I’m interested in it, to be honest. And now I REALLY want to read The Imposter Queen. *sighs* If this keeps up, I’m going to drown in my TBR. I would apologise to your TBR…BUT I’M NOT EVEN SORRY. *cackles evilly* But I promise my next review won’t be so convincing. Hehehh. I LOVE IT WHEN YOU FANGIRL. Now I want to read this book. Stat. A dark and violent Frozen? YES PLEASE. Caaaaait, I so need this book in my life! It sounds so good, and I’ve heard nothing but praise for it! God, it sounds so good! High/epic fantasy is what got me into reading, so I have a huge weakness for high fantasy, though I don’t read as much as I used to. Trying to get back into it this year. And I neeeed this book! Okay okay okay! You’ve got me!! I need to get my hands on a copy ASAP! High fantasies are my weakness as well and now I’m dying to see what got you so over the moon excited for this one! Great review! I really want to read this now!! I saw it at the start of the year and was like eeeehhhhh should I? Shouldn’t I? But clearly the answer is yes. My favooouurite genre is YA Fantasy – although historical fiction comes at a pretty close second. Anything with dragons, man, anything (dragons = chocolate-levels-of-yes). I can’t think if I’ve ever had an author where I was a bit ‘meh’ to start with – there were plenty of authors who I wouldn’t have read if someone hadn’t prodded me with a stick (such as Sarah J. Maas, Renée Ahdieh, Julie Kagawa, and Leigh Bardugo) because I’d be like yeah, yeah, I’ll get around to them, #LessonLearnt. But let’s just take a moment to die over the fact that you said a darker Frozen, I’M SO THERE. Bring Disney into anything and I’m sold. Literally: “Hey Kirstie, here’s a book about a turtle and flies to space, it’s loosely based of Pinocchio” – I would buy it. I love fantasy so much. Also historical fiction. Thy are my faves. I don’t know… I didn’t really love Tamora Pierce the first time I read her then I read Protector of the Small and I WAS IN LOVE. 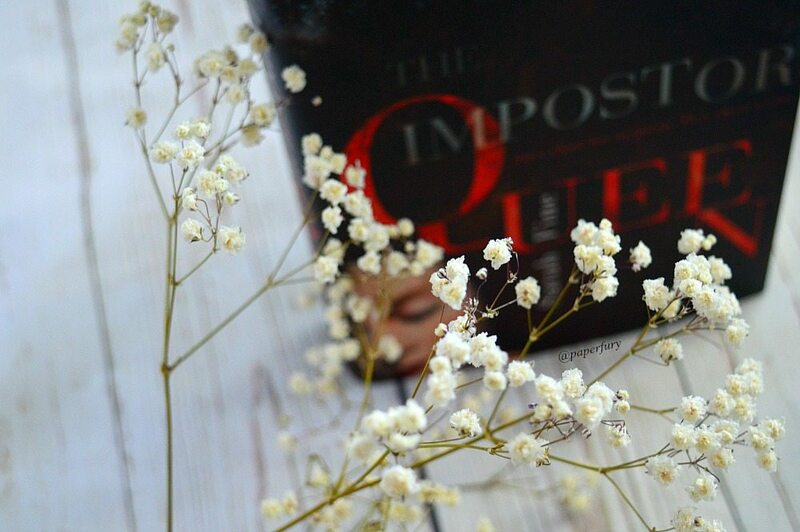 (you should read Tamora Pierce= epic girl power fantasy with animals and fighting) The Imposter Queen sounds great! I wasn’t really a fan of The Orphan Queen by JOdi Meadows so now i’m wary of Queen titles. BUT I WILL OVERCOME IT. I loved the fire and ice ideas in snow like ashes, and this sounds totally different but equally awesome. Thanks for the revieew! If a fantasy book is good, it can swallow me. I need to read this. Love the character names too – very Norse/Scandanavian. YES TO FANTASIES SWALLOWING PEOPLE. I am always happily swallowed by a book. :’) *Whispers* and I feel the same about Ally Carter! I mean, I’m not as in love with Embassy Road as you, but I definitely think it’s better than GG. This book sounds like….like… really you leave me speechless after all those politely shrieking descriptions!! Sooo…. this book is going directly into my tbr!! Oh my goodness, now I need to read this book!! Although I may wait a bit so that I don’t have to wait as long for the sequel….that would drive me nuts! “I also want to admit it feels like a violent YA dark version of Disney’s Frozen” THAT’S IT. I’M HEADING TO THE LIBRARY! SEE YAH! seriously though, after that sentence, I was pretty much sold on this book. it sounds so AWESOME! although first i’ll have to finish all those other library books I checked out….later. I SHALL DEVOUR THIS ONE FIRST! OH GOOD. 😂 I was worried that would be too weird of a pitch but *whispers* I totally adore Frozen, hehe. It is a bit hard to tell…I mean, I’m totally dithering in this review and gah, so haaaaard to tell if I liked it. 😂😂 OMG YOU ARE WONDERFUL. GO READ IT. HASTE HASTE! Oh dear! I’m a silly little hooman… I was migrating to a WordPress site and I think I kept putting in my old blog address. Oh Botha. Currently everything is down for a revamp/launch which will hopefully be soon! Until then if you’re interested in lil ole me, I’m on Instagram as anovelowl and you can see some of my reviews at newleafbooknook.com!! I very clearly need to read this book. It will hopefully get me out of my book rut. I think it’s mostly last month’s fault. Last month I read 37 books! This month I had read…five. Not my greatest month ever. IF I’M TO READ FOUR HUNDRED BOOKS THIS YEAR, I NEED TO READ MORE THAN FIVE BOOKS THIS MONTH. But this sounds seriously epic. And a darker, violent version of Frozen is actually a good way to sell it to me, because now I’m totally curious and want to see why it’s a darker, violentier (is that a word? I don’t think so) version of Frozen. GIVE IT TO ME NOW, LIBRARY. Awk, book ruts are sucky. *pets shoulder and feeds you cake* Maybe you’re just worn out from last month’s feat? (WHICH IS INCREDIBLE BTW, AND I AM ASTOUNDED. My biggest reading month has been 31 I think.) OMG BUT 400 BOOKS?!? YOU CRAZY FIEND. I’M ROOTING FOR YOU. Violentier should be a word. I salute you, brave warrior! I wasn’t sure about this book, it kind of made me feel “meh,” but YOU CONVINCED ME. I WILL RIDE TO THE LIBRARY AND DEMAND THE IMPOSTOR QUEEN MWHAHAHAHA. Plus why are you pictures so beautiful XD THEY ARE OH MY GAWSH ASDFGHJK. Lovely review 🙂 have a great day! AFDKJLAFDS THANK YOU. <3 I was really pleased with this photoshoot tbh. hehe. And omg YES. RIDE THOSE DRAGONS. GET THEE TO THE LIBRARY! HUZZAH! My weakness is fantasy, but it has to be good. Like Daughter of Smoke & Bone good… and, sadly, books like that are few and far between. I don’t think I’ve really read any “meh” authors that turned into “yay!” authors for me. If I’m not that impressed with the first book I read, I’ll probably not read another (and, in the cases where I have, my opinion has gone down… not up). This looks like an interesting one, though. The Scandinavian influences sound cool. I try to always read at least two books by one author. I mean, unless I LOATHED it with the fire of a thousand suns. If I’m all “meh” about it, then I’ll try again. Although, tbh, I picked this one up mainly because of premise and only afterward realised the author was one I’d read two books by and hadn’t been impressed. I’m glad I gave it the chance though!! My weakness is extremely well written YA fantasy. Seems like this book fits that description. And OMG dark Frozen? GIVE ME COPY!!!!!! EM NEED BOOK!!!! Also, I felt kind of meh at first when I read City of Bones. Then I read City of Ashes, re-read City of Bones, and decided I was absolutely in love. I’m a big believer in giving books, authors, and series second chances. Soturi actually means a warrior but otherwise you’re right 🙂 I LOVE the fact that the book is set in a Finland inspired world! That hardly ever happens, which makes me super excited! It’s such a shame not more of our books are/can be translated to English, most notably Väinö Linna’s Tuntematon sotilas is practicaly untranslatable if that’s even a word 😀 That’s because the dialects play such an important role in the book. If you’re interested in books by finnish authors, I recommend Emmi Itäranta’s Memory of water. It’s a beautiful novel about a girl who hides a water source at a time that water is strictly controlled, because her father told her to. And tea seremony also plays a big part in the story. Anyways, definitely piqued my interest. Adding to my TBR and definitely buying once I’m done with my book buying ban! I hope the character wasn’t that one from Kiera Cass’s The heir. We got quite the laugh from Henry Jaakoppi 😀 Our dystopian horror images came true, we were part of Sweden again! Anyways, I have a post request. I was hoping you could do a post where in the comments people could recommend books that are translated from their mother tounge to English 🙂 No pressure or anything, it was just an idea that popped in to my mind but one that I would LOVE to see executed! This one sounds really good! I’ll definitely have to read it. Also, I love, love your photograph. AHH THANK YOU. <3 I really loved how these photos turned out. *sniffles happily* Ahem. But omg fantasy is the most delicious thing of my LIFE. But I do get tired of it? Like not tired-this-is-all-dumb...actually physically brianishly EXHAUSTED. I think fantasy needs you to concentrate more than, say, contemporaries, right? It does make sense! I think it depends on which tropes we enjoy, as readers, right?! Like I'm so down with the hidden royalty trope. I can read it a zillion times and still love it. <3 But other tropes I just roll my eyes if they come up too much. Dystopian. Hands down. But since trends have long since moved on from hungry children and revolutions, mild fantasy with kingdoms and oppressive rule would be my next choice. They’re pretty close actually, apart from the magic and fantasy is a bit more flamboyant. I always struggle with the world building as it feels like the reader is dropped into the middle of a conversation and ain’t no one coming back from that smushy. But this sound glorious, apart from the characters not actually singing Let It Go. I need this book! Awesome review pocket smushy, I shall go forth and purchase this in my next buying spree. Ooh, the dystopians do seem to have burnt themselves out a bit and fled, don’t they? Andything with an oppressive rulership is, of course, glorious. I’m taking tips. *flips hair majestically* But YUS, fantasy does have that habit of tossing you in blind and then leaving you to drown in a new culture with no help. :O This one does that a LITTLE??? But it only took me like 3 chapters to get into the swing of things. Omg, I should’ve deducted a star in the rating for no singings of Let it Go. SHAME ON THE IMPOSTOR QUEEN FOR THIS FAILING. YUS. Nothing describes me so well, tbh. *flails grapishly* Ahem. AND OMG YOU LIKE FROZEN?!? Well…I could never have told… 😉 MWHAHAH. JUST KIDDING. YOU ARE AWESOME. I KNOW I’M TERRIBLE😂 But I promise there is a lower-starred review coming later this week. I will save you and your TBR. 😉 Ahem. And YES. I suppose it does have a bit of a GoT feel…but not in a “I’m trying to be the YA GoT” which is so so good because I hate it when books try that. 😂 But John Snow would definitely fit into this society. hehe. YOU NEED IT LIKE 10000% I PROMISE. *nods wildly* And omg the characters just totally stole my heart in all the frozen bearishness. And it was so so kickass, omg. Plus I’m not afraid to admit I love Frozen so so much. 😂 ALSO SIG. <3 I would read an entire book about him, tbh. Fantasy all the way!! It will forever remain my one true love! May I just say THIS BOOK SOUNDS FLIPPING AMAZING It has everything I could ever ask for, except maybe dragons, which are kind of a necessity, but I’ll let it slide because your review was PERFECT! I must read this book now, MUST!!!!!!! Saaame. *tackle hugs all the fantasy books* And honestly, when I look at my shelves of the books I’ve bought or whatnot…it’s all like 80% fantasy.😂 I possibly have a small addiction. hehe. BUT YES NO DRAGONS HERE DANGIT. That is The Impostor Queen’s only failing. FANTASY IS THE WONDERFULEST ANSWER. YOU CLEARLY ARE THE MOST AWESOME OF EVER. THANK YOU! I have never been called “THE MOST AWESOME OF EVER”. I love it! This book sounds AMAZING!!!! I absolutely love fantasy and I love it when the world building s on point. I just had to DNF a book because there was NO word building. I mean, seriously, the author would just use random weird words and give no explanation as to what they meant. It was like reading another language, which just irritated me. This one sounds pretty awesome. THIS BOOK WAS AMAZING AND YOUR DESCRIPTION AND REVIEW OF THIS DOES AS MUCH JUSTICE TO THIS BOOK AS ANYTHING EVER WILL – also, Oskar? Big fuzzy bear-like Oskar? (That was my impression of him, okay, don’t judge…) It’s so rare to find a male love interest like that anymore, what with all the cocky but secretly soft-hearted guys taking up the space. The funny thing is, guys like Oskar are really exactly what I’d want in real life! Someone to cuddle with….. (those scenes were seriously the cutest.) And there were twists and torture – which I think completed the book and made it really well-rounded. It balanced out the story, and showed how Elli as a person, as a woman, grew through the book. She was weak, and she grew strong….(er). 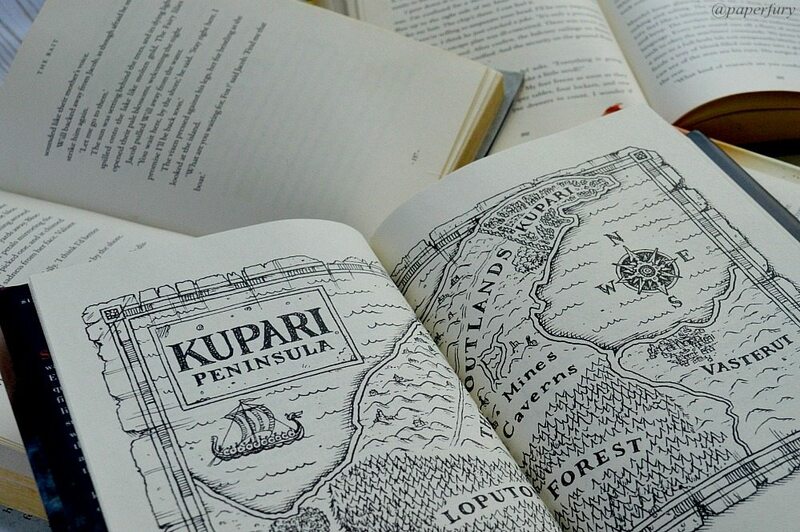 Urgh I need this book, especially because the map it comes with looks most gorgeous. This is a greatly important thing to me. I have heard such consistently great things about this, and am so pumped! I’m usually let down a bit by YA royalty because I am kinda like WHERE IS THE BLOODSHED AND TREACHERY? Ahem, too much GoT has addled my brain. I never knew I wanted a violent version of Frozen until I saw this post haha. EVERYONE SHOULD WANT A DARKER/VIOLENT VERSION OF FROZEN, TBH. I saw this at Barnes and Noble and so wanted to get it! I love the concept of the two elements being balanced and making the “chosen one” and yeah, I love that it was turned on it’s head! However, I read the first couple chapters and didn’t really like the main character. Like you said, she seemed almost too good and that grated on me. I decided to put it back but I think I’ll be going back for it soon since I’ve heard some great things about it! AHHH YES YOU NEED TO READ THIS, ASHTYN!! I mean, it sort of plays around with the “Chosen one” trope…so it’s still tHERE. But it’s really hard to talk about without spoilers so I shall shush.😂 But I DID love all the twists on the average-tropes. EEEEP. 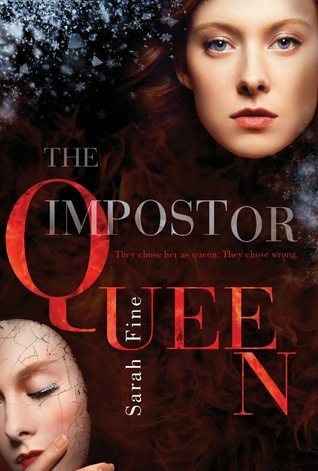 I thoroughly enjoyed THE IMPOSTOR QUEEN! It quite surprised me, but the instant the magical system is first broached, I was IN LOVE. Your list about why people need to read the book is PERFECT! I just got this in the mail today from a book swap and I’m so excited to read it!! It sounds amazing!! This sounds like a really good book. Those names are really interesting, really unique. But your description of the magic system is what makes me curious, I love complicated magic processes and all that, I can’t wait to read what twist they added to this book 😀 Thanks for the review Cait! Ummmnnn…FANTASY. FANTASY ALL THE WAY. I love it! And this book looks/sounds AHH-Mazing! I will definitely be adding it to the pile!! I was pretty soft on Six of Crows/Leigh Bardugo at first…NOW I am obsessed. OBSESSED! Also Christina Lauren (NA Romance writer)-was not impressed with their first book…now I LOVE THEM! Alsoooo I am DYING to read Princess of Thorns…my local Library has it on order and I am waiting impatiently. OKAYYY that’s it, I”m reading this!! THIS SOUNDS SO GOOD. I’m interested for almost any well-written epic fantasy, and this one seems to have that and so much more! SO agree with you on this one!! I adored it too, and that year wait is going to kill me! I AM SOLD. I want to read this book ASAP. I love everything you’ve said about it. I NEEDS. RIGHT NOWS. It is a genuine concern of mine that in 2016, I’ll read NOTHING BUT CAIT-RECOMMENDED BOOKS! I’m not even joking about this. The past few I’ve read were, like, the Seven Realms series, The Accident Season, Disruption, Corruption, AND NOW THIS?! Whenever GR prompts you to tag whoever ‘recommended’ the book to you, my brain melts into a puddle of anxiety. DO I TAG CAIT IN THIS *AGAIN*? DOES THIS QUALIFY ME AS SOME KIND OF A WEIRD LITERARY STALKER OF ONLY-THE-BOOKISH-VARIETY? IS THERE SUCH A THING? So. Impostor Queen. (Also, those names sound vaguely, um… Nordic? I’ve had a lifelong obsession with Finland (for NO reason whatsoever other than… I DECIDED I’D OBSESS at like 14 and never stopped). They pretty darn Finnish-sounding. So your Frozen-retelling assumption is probably dead accurate. Yup. I APPROVE OF YOUR HABIT OF READING BOOKS I HAVE SAID YOU MUST, THOUGH. And c’mon now. Have I ever lead you astray? (Spoiler: no of course not.) ERGO YOU ARE PERFECTLY FINE. READ ALL THE BOOKS I DEMAND. *squishes this book in your face* Zomg, tag me all you like! !😂 It absolutely makes my DAY when someone reads a book because I said to. :’) Btw, you need to read My Sister Rosa. Ahem. Just sayin’. I HEAR YA WITH THE OBSESSION. That is me for, literally, everything. I have an obsession with Paris for exactly no reason. I hear the coffee is good, so that’s positive. BUT I GOTTA GO TO PARIS SOMEDAY JUST BECAUSE OF THIS. OOOH! This book looks scrumptious! Going to have to give it a try! I totally want to read this book . . . . like RIGHT NOW. That’s how most of your reviews make me feel. Fantasy is probably my genre weakness, though it could also be Steampunk (I love well written Steampunk). The author I felt “meh” about at first and then was totally astonished and awed by was Jodi Meadows, author of the Incarnate trilogy and The Orphan Queen. I started reading the first book in the Incarnate trilogy but gave up on it, then months later tried to read it again and fell in love with it and the rest of the trilogy. And then I read The Orphan Queen and was blown away. It’s a book about a queen (hence the title) and it has magic and outlaws and vigilantes and kingdoms in it, so you might want to read it. 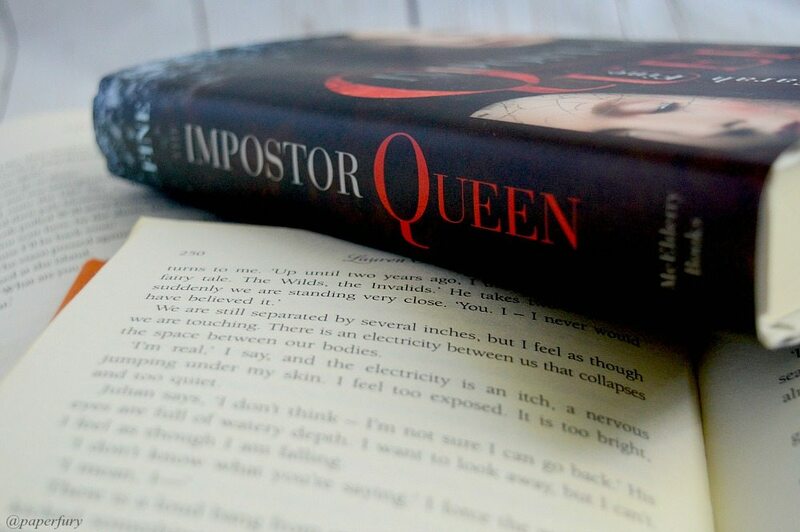 Now I’m going to add The Impostor Queen to my reading list on Goodreads . . . .
I’m actually really loving the sound of this book! I have it, but haven’t started it yet which now sounds like some sort of crime. I recently finished Shadow and Bone and loved it, so knowing there are similarities draws me to this one all the more. Especially as I love epic world building and ti seems like the plot doesn’t disappoint for this one either! Ummm… this sounds AMAZING why has no one told me about it before. I’m definitely putting this on my TBR!